With the PersistentTableArray class of the non-commercial .net library finaquant® protos you can read and write in-memory tables from/to a relational database together with their instance information. If you have already installed Microsoft Visual Studio C# 2010 Express or a higher version on your computer it is quite easy to get started with persistent table arrays. The installation file of Visual Studio is packed with a free database SQL Server Express you don’t need to install a database software separately. 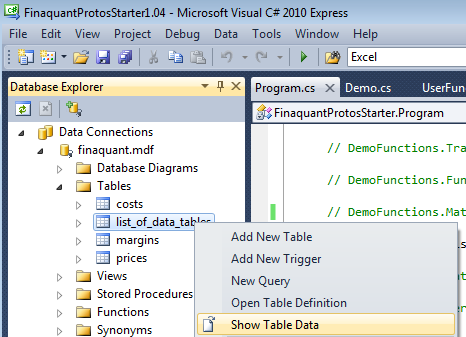 You will need Visual Studio in any case to run the demo function for persistent table arrays in the Visual Studio project file FinaquantProtosStarter which you can download at the product page of finaquant® protos. string ConnStr = “@"Data Source=.\SQLEXPRESS;AttachDbFilename=C:\Users\Tuncali\Documents\finaquant.mdf;Integrated Security=True;Connect Timeout=30;User Instance=True"
Following steps explain all the preparations required for running the related demo function in FinaquantProtosStarter. 1) Install Microsoft Visual Studio C# 2010 Express(which is free) or a higher version. Select “install with a database” if you are given the option. 2) Download and install the latest release of finaquant® protos. 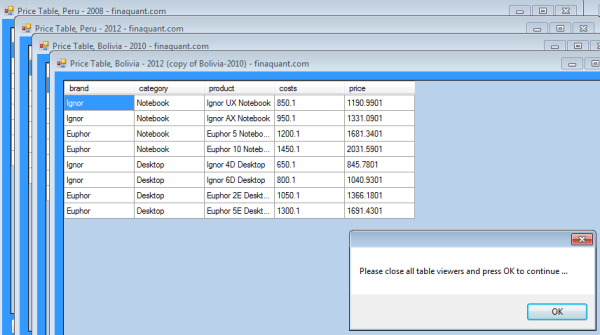 You need to be registered and logged in at finaquant.com in in order to download this file. 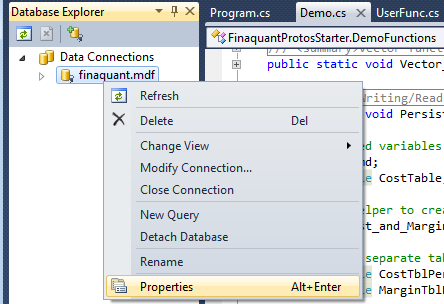 4) Open FinaquantProtosStarter solution file (with Visual Studio) and create a new database named finaquant. 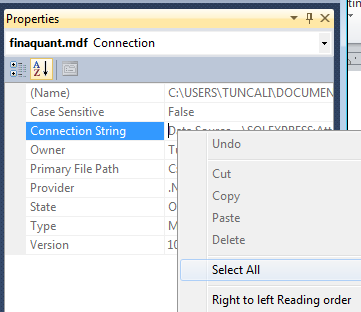 A) Open FinaquantProtosStarter solution file (with Visual Studio) by double-clicking on it. Persistent Table Array needs an initially empty and dedicated database. 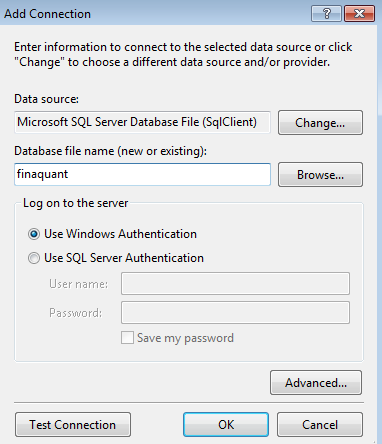 … enter the name of the new database (finaquant) in the opening window. Then press OK without making any other changes. Confirm the next window asking whether the database should be created with OK.
5) Set the database connection string in the demo function Persistent_Table_Array() in code file Demo.cs and run the method which calculates price tables for given instances of cost and margin tables. B) In order to get the connection string right-click on the database and select properties. C) In the properties window right-click on the field value for connection string, and select Select All, press Control-C to store the connection string to clipboard. E) Out-comment all other demo functions, un-comment DemoFunctions.Persistent_Table_Array() in the code file Program.cs and press F5 to run the demo function. This demo function should calculate and display price tables for each instance (country and year) of cost and margin tables. 6) Check the database to see which table are created. The table named list_of_data_tables has an entry for each instance of data tables. This entry was posted in Calculation engine and tagged database, table array. Bookmark the permalink.